Another couple of precious days have passed. It is really hard to prevent thoughts of life after vacation from seeping into my brain at this point. The first of these noted precious days was spent at Krka, which is one of Croatia’s national parks. Like everything else, it was completely overrun with thousands and thousands of tourists. However, it was worth the day trip and would have easily been worth another if we’d had one to spare. Krka is famous for its waterfalls, which pass over and through an amazing limestone landscape. A wooden boardwalk winds over the streams and pools which are teaming with fish. Eventually all of these streams converge in a dramatic series of waterfalls. The icing on this limestone wedding cake is that once you reach the bottom of these tiers, you can take a little swim. I was actually becoming increasingly grumpy with the traffic jam of tourists on the boardwalk and I wasn’t really sure that the lineup for the change rooms was worth it. Stephen and the kids were gung-ho, so I went through with it despite my rising agoraphobia. The water was perfect and actually not that crowded. After carefully helping the kids test out the water, Stephen and I swam up to the waterfalls on our own. Thank you Jelena and Dave! We actually climbed up on one of the limestone formations and sat under the pounding waters of a small waterfall, which is something I’ve always wanted to do. Before we knew it, it was time to go home. If we’d had more time, we could have visited a monastery on an island in the middle of the lake, explored the park’s Roman history and hiked trails away from the throngs of tourists. I would really like to come back and do this one day. I have to mention that we grilled fish in an authentic wood burning barbeque that evening. It was a great experience, although fish is so frustrating to eat, especially with young kids. I had to root through every little piece of fish to take out the bones before feeding it, forkful by forkful, to the kids. Not exactly satisfying. Today we were off to Split, which was a seemingly endless, stop-and-go bus ride away. We were hoping to take the ferry from Trogir, but the wind was too strong (Stephen’s hat escaped across the busy road not once, but twice today). 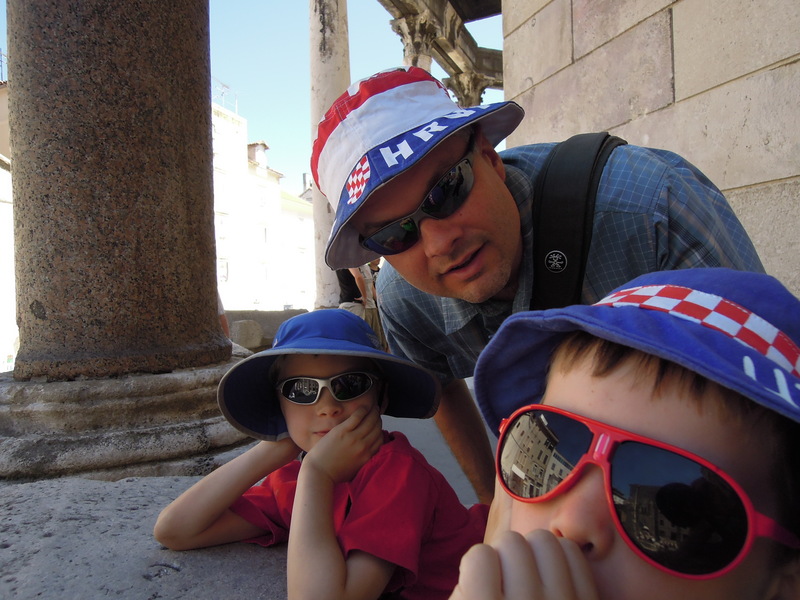 We finally arrived in Split an hour after leaving Trogir and hiked down to Diocletian’s palace on the waterfront. We spent the afternoon eating ice cream, wandering the maze of streets in and around the original palace walls, and doing a little shopping. We haven’t done any shopping on the trip so far, but Split had some interesting shops and some reasonable deals. We really didn’t spend much of our time in these shops, but it is notable that we went into any as none of us like to shop. I bought a necklace after much soul-searching and Stephen and the kids bought some clothes. We, unfortunately, had the worst meal of the trip in Split. I knew we were doomed the moment the off-coloured, tasteless wine was delivered to our table. The mussels I ordered were so shriveled, cold and tough that I deemed them inedible and angrily marched them into the restaurant to let them know. I was hoping that they would simply not charge us for them, but they insisted on making me another order. The second attempt was somewhat better than the first, but it still took me a little while to regain my good mood after that experience. At some point during the day, a random old man approached me and insisted that I take the boys to the beach. We didn’t know Split had a proper swimming beach as it is dominated by a busy working harbour. But we followed the old man’s advice and-lo and behold-found the first sandy, gently sloping beach of the trip. The kids had a great time running in and out of the water in their undies while Stephen and I watched nervously from the shore (it was crowded and Landon likes to range further and further from us). Tomorrow we are off to Zagreb and the final countdown will have officially begun. We have 3 full days left before we travel home. By the way, I used the left over sardines which nobody but Jelena enjoyed eating and created a tasty fish tart. It was my first time using phyllo pastry. I am always very pleased with myself when I take left overs that no one wants and invent something that ends up being quite good!